talkhealth > Blog > 2015/11 > Vegan flavouring? What do vegans taste like? Ever eaten a vegan? No me neither. I don’t know what they taste like but I’d probably be allergic to vegans since they consume a lot of nuts to get protein into their diets. 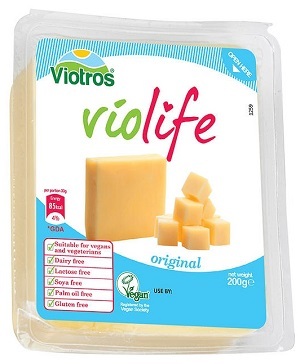 Joking aside, this new dairy and soya free cheese from VioLife, discovered in my local Morrisons, is probably the best freefrom cheese I’ve ever tasted. I have always been of the opinion, having eaten real cheese before, that if you’re allergic to cheese the freefrom fake cheeses are best avoided. I’ve always found them very disappointing when compared to the real thing. With the exception of a few. I love Mozzarizella but cannot find it anywhere in the shops and only available on vegan websites which have delivery charges and I don’t want to order enough to make the order worth my while. I have tried the VioLife Original’ which is the only one I’ve seen in the shops. You can find it in the cheese section in Morrisons and I think Holland & Barrett stock it in stores and online too. Visit the VioLife website to find out what other vegan cheese and products they make. So how do they make it and what are the ingredients? VioLife original contains: Water, coconut oil (23%), Modified starch, starch, sea salt, vegan flavour, polyphenol, colour – b-carotene. Not a massive ingredient list but two things worry me. The vegan flarour and polyphenols. I have asked for feedback on what exactly their vegan flavour is made from, apart from real vegans. And if you’re wondering what polyphenol is, it’s a generic term for the several thousand plant-based molecules that have antioxidant properties. The health benefits of antioxidants are well known and polyphenols are also helpful for regulating enzyme function and stimulating cell receptors. I’m not sure I’d recognise a polyphenol if I came across one and I do live by the general ethos, if Granny wouldn’t recognise it, don’t eat it, but I don’t seem to react to this cheese. I am treating it like a special reward. I am not eating it all the time, though you can buy a few at a time as the shelf life is fairly good. Is this good or bad? I’m not sure, though cheese lasts fairly well when wrapped in the fridge. But most of all, do try this dairy free cheese. It’s pretty good just eaten from the pack and also melts on toast. Not cooked with it so far but I’m a lazy cook. Have you tried this cheese? Have you ever tried a vegan? What are they made from and what do they taste like? I will be updating this blog with an explanation of what vegan flavouring if I can get hold of VioLife to find out. best dairy free cheese, best freefrom cheese, best soya free cheese, dairy allergy, dairy free, dairy free cheese, egg free, free-from, FreeFrom Food, gluten free, nut free, soya, soya allergy, soya free, soya free cheese, Vegan, vegan cheese, vegan flavouring, vest fr, VioLife dairy free cheese, VioLife Original vegan cheese, what is vegan flavouring?